My short-term memory is not the greatest. It’s not uncommon for me to have seen a pattern I loved and only remember the name of the publication I saw it in but not which issue, or maybe just what the cover looked like. 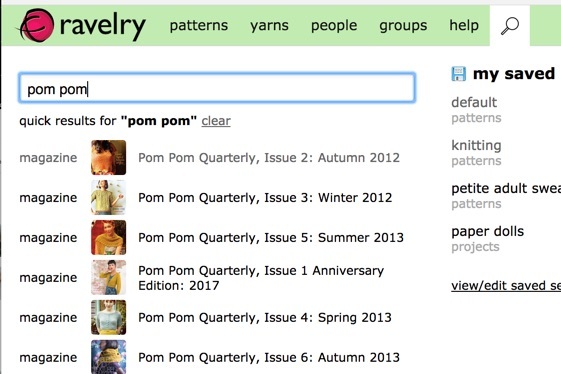 Today’s tip is how I use Ravelry to find those patterns. My first step would be to use the magnifying glass search from the top navigation, and enter the name of the publication. A publication can be a book, a magazine, a pamphlet – some grouping of patterns put together by the creator. I can click on any of those results and be taken to the page for the publication. 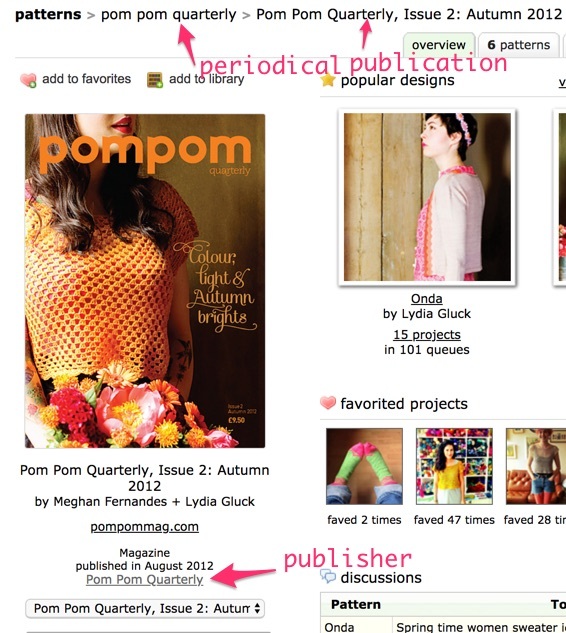 The publication page will allow you to look at the patterns in the issue, as well as linked projects. Additionally, it has links to two places we want to look – the periodical and the publisher. The periodical is the magazine itself, and the publisher is who creates the magazine. In some cases they’ll overlap completely, but in others the same publisher can have multiple periodicals. Publishers can also have other kinds of publications, for example a yarn company that produces patterns for their yarns organized into pamphlets. 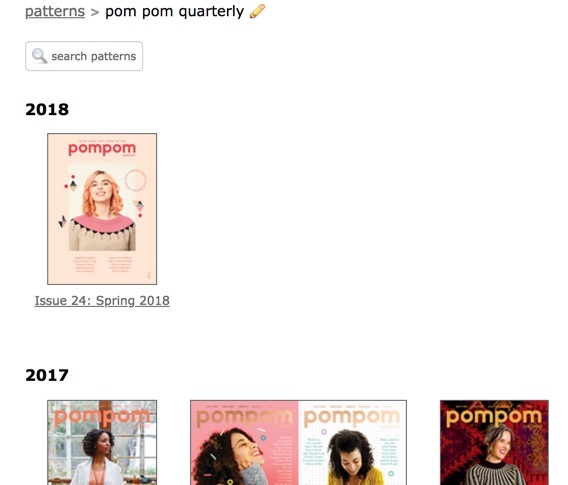 The periodical and publisher pages look the same – there is a listing of every of all the publications, grouped by year. I can scroll down the page to peruse the covers and see if any of them jog my memory. I can also click that search patterns button at the top of the page and be taken to the advanced search for this periodical/publisher – all the results will be pre-filtered to those within the listed publications. From there I can page through or use additional filters to find what I am looking for. Try this trick to help your foggy memory, or to see if the publishing house that put out your favorite knitting or crochet book has any other titles you’ll love.